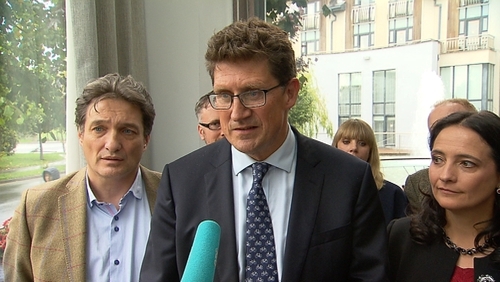 The Green Party leader Eamon Ryan has said he has "no confidence" in Ministers Shane Ross and Denis Naughten. Speaking at his party think-in event in Naas, Co Kildare, this afternoon, Mr Ryan said when it came to cycling, Dublin could be like Copenhagan, but not under the current Transport Minister Shane Ross. He also accused Minister for Communications, Climate Action and Environment Denis Naughten of a lack of leadership in his Department. Mr Ryan noted the need for electric cars but criticised a lack of charging points. "I'm afraid I don't have confidence in either minister to make the changes necessary," he told reporters. Mr Ryan also criticised Fine Gael's record on dealing with environmental issues in Government. Mr Ryan said: "By your actions you should be known. Not by your tweets. I think their actions as a Government have made them the worst Government I have ever seen, in terms of environmental action at the very time when John Sweeney said in the Climate Action Committee this week, that we can put it off for no longer. "We have to change our entire transport system, and our energy system, our entire food system, our entire waste system, and we have to do it in two or three decades. "This country is going to be good at it and we are going to benefit from it but not if we are stuck with Fine Gael leadership which is all about protecting the status quo and vested interests," said Mr Ryan. The party's other TD, Catherine Martin, said the party has ambitions of winning six seats in the next general election. Kildare North general election candidate Vincent P Martin launched the party’s 'Commuters' Charter' today. This charter details how the party will focus on delivering changes in public transport needed to protect and help commuters, while incentivising others to use less polluting transport options. Mr Martin said that there has been the greatest population explosion in Kildare in the last 20 years but transport services are not adequate for all the commuters in the area. He pledged that the Greens in Government will help improve people's quality of life through the commuter plan but also through the provision of more creches, schools and playgrounds.